Most people would agree with the sentiment that there is nothing like a good breakfast to start your day off right. 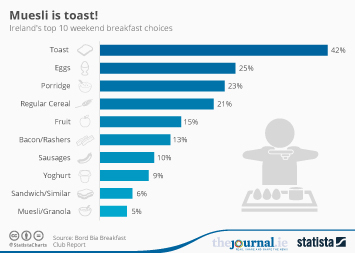 Breakfast foods range from bread to cereal-based or egg-based dishes and can include products such as bacon, sausages and refrigerated or frozen goods such as waffles or French toast. Ready-to-eat cereal was by far the largest category with dollar sales amounting to about 8.78 billion U.S. dollars in the United States in 2016. The U.S. cereal market is dominated by General Mills and the Kellogg Company. The two competitors went head-to-head over sales of ready-to-eat cereals in 2017. However, among individual brands, store brand cereal still beat out both companies in terms of sales. In the bread aisle, fresh bread companies such as Grupo Bimbo, which owns Sara Lee and Oroweat among many other brands, and Flowers Foods Bakeries Group dominated the market in 2017. Crusty/hot hearth breads were the most purchased bread type in the United States in 2017, based on retail-tracked sales.